Another piece I will be offering for sale. I've posted this image before, also, but not talked about it. I'm not really sure where it came from. Oh, I don't mean I found it an alley somewhere & just hung the beads there - I made it with my own two hands, but still. Well, still is really the word. As in sitting still. As in sitting. As in just sit. Just breathe. Just sit. Just breathe. It was made about the same time as Suttee Gate I & I had this grandiose idea that I would make tons of chair altar pieces, but I never did. I tried, but I hated everything, and just gessoed over the poor things, or painted over them, and just stuck them back. Nothing very still about it at all. 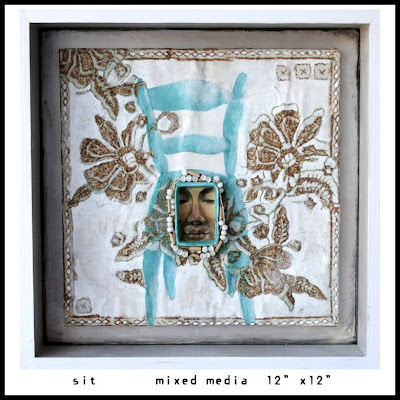 I was full of hurry, full of annoyance, full of rushing, full of self-judgment, self-criticism, and although I have taken photographs of chair altars, I've not made any more mixed-media pieces. I like this piece a lot. It speaks to me quite loudly, telling me to slow down, to calm down, to take a moment, to just sit. Sit. But I am willing to let it go. Finally. I have been so shy about showing my work to real people - you know, people who are right there in the room with me, looking at my soul hanging quite indecently outside of my body. It's been a dozen years since the last time I showed any art in a public place. In my defense, there aren't many places around here to do so, but at the same time, I haven't tried. I've just made a piece here, painted a painting there, dilly-dallying, not admitting to myself that I really, really, really want to be an artist, want to be a writer, want all those silly things you want as a child, but know instinctively that they are just a child's wishes. I also wanted to be a florist. I just wanted to be surrounded by pretty things. My mother tells a story about me - when I was about 2 or so, a million years ago, when it was safe to do such a thing, she & my father would park their car at a closed shopping center, and just let me walk from shop window to shop window, admiring the displays. They would watch me from the car, and I would meander along, saying "things! ", pointing out pretties to them. I still do, but they're not watching, and I've learned not to point, but still. Pretties. So this show. June 11. One night only at Caffe Tazza, a local coffee shop. The invitations/announcements must be designed this weekend - I must fit that in with all the painting waiting on me. I am scared that no one will like my "pretties", that I will return home with every piece, but at the same time, I am excited to be back in the game, whether I sell anything or not. Just writing about it all makes my chest feel tight. I just need to sit and breathe. Wow, I am so in love with your work! I love the media, the colours, the subject matter. It is scary to put our art out for everyone to see especially when we put so much of our selves into it. I think you have hit on the right note here though, breathing is just what is needed. Congratulations for feeling the fear and doing it anyway! I am sure people will love your art as much as I do. she is beautiful and speaks to me of the rest i discover deep within myself whenever i need it most. It takes a bit of 'hustling' to get one's work out there. I too, am not good at it. I'm trying to remedy that (when will I start?). We all know that even if we don't generate immediate sales, we still have to get ourselves out there, huh? What a beautiful series so far from what you've shown! Paula - Wouldn't it be great if someone just showed up at your front door & saw your work & loved it, etc., etc., etc? Well, that kind of happened with me last night. New neighbor. It made me feel pretty darned good, if I may so so myself! One can only dream! But, I've heard too that if your ship doesn't come in, swim out to it! I guess I'm fixing to swim out to it! Me too! I'm having ideas! Silly, you. Everyone will love your work. We all love your work. Your advice to yourself was also perfect for me. I think we both need to sit. Just to sit and breathe and be. Yes. Let's sit together - across the miles. Relyn - Oh, I hope so, but I also hope I will not be heartbroken if they don't. I will just breathe into the moment. Dear Debi, anyone who looks into your soul sees profound beauty there. They see it in you, and they see it in your deeply expressive artwork. I am beaming on the inside for you and for this show that I so wish I could come see!!!!! !